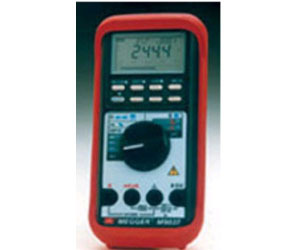 Dual display Analog bargraph updates 128 times every second True rms d.c. + a.c. and Average Responding Basic accuracy from 0.08% The M8000 models provide more advanced features for applications requiring more extensive measuring capabilities. The M8037 is the is the top-of-the-line instrument. It measures TRMS dc and ac which will allow more accurate measurements of various waveforms: sine, sawtooth, square, pulse trains, triangle, spikes, etc., as well as distorted waveforms with the presence of harmonics. The M8037 also features a backlight display for easier reading in poorly illuminated areas. Both the M8035 and M8037 have basic accuracies of 0.08%, dual displays and the choice of operation in the manual or autoranging mode. Capacitance, frequency, conductance and diode test facilities are included as standard features, plus for more advanced measurement applications the ability to record, store, sort and compare results is also provided.